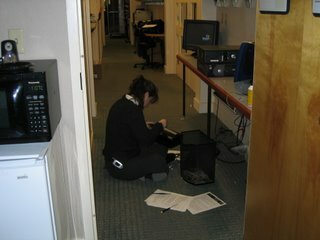 My co-worker Lisa was trying to fix the jammed shreader. We teased her all day long about it. I can't believe the G3 Mac is still on the desk. I thought it would be in the trash by now. Is the shedder up and running yet? Sounds like somebody put too much paper in, busted.